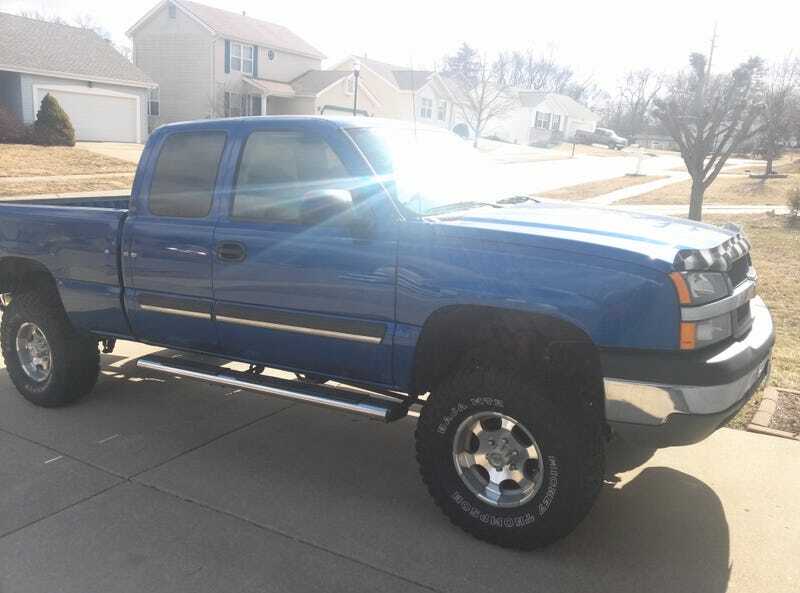 2004 Chevy Silverado 1500: My dad's midlife-crisis "mistake"
One of five special edition Silverados sold by a dealer (which is now out of business, btw) It came right off the showroom floor with a 6 inch lift and 35 inch mud tires. This truck should have never seen this space on our driveway, at least according to my mom. It was purchased from a dealer an hour away in Pacific as a heat-of-the-moment sort of thing to replace my dad's always troublesome '99 Tahoe. Having spent that last 10 years in my father's hands, it has been through a lot with us and really caused us no trouble, besides the massive bill to replace the 35" tires. I've always wanted to do a review of it and finally signing up for this site has given me the chance to, so here it goes. I've always liked the looks of this generation Silverado. It doesn't have that big, upright face of the generations that proceeded it, or the boxiness of the generations before. It has some nice round corners and I really like the metallic blue paint on it. I also like the fact that Chevy spelled out their name across the tailgate rather than stick a gigantic logo on the back of there: looking at you, Ford. I can't say I like everything my dad has done to it though. He's put one of the god-awful rear window stickers on it that's all faded and just needs to be removed. Also, it's hard to see, but the dealer put a horrible pinstripe down the side that's crooked and now sun faded. There used to be side steps that only worked for the front doors, but those have been replaced with full length ones. It's pretty spartan in there. There's no reverse camera or even the push-button 4-wheel drive, nope none of that. You could get an okay Bose stereo, but his only has the standard system, with a blown out passenger speaker. What you do get is some very comfortable, manually adjusted front bucket seats. A big center console, electric windows and door locks, and dual zone climate control. Oh, and cup holders that don't hold anything smaller than a big gulp without it toppling over. It might only be one step up from a work truck, but the dealer ordered it with the 5.3 VorTec rather than that ancient 4.3 V6. Having been tuned by my dad, instead of the factory 295hp, it now makes closer to 325-33ohp. This engine has a pretty loud roar to it thanks to those big Magnaflow pipes sticking out the back. It accelerates pretty briskly, though my mom's Vue will beat in a race to 60. It drives like a top-heavy, body-on-frame truck. It doesn't try to act any different from what it is. I have managed to get full on sideways in it before. (In an empty parking lot) It works well off-road, as it was designed to, and can go through decently deep streams/ponds. It's really fun to hoon around in a snowy field. There's a lot of play on center in the wheel, but that's probably a result of having big tires. It's not in the best shape, as it's main caretaker is injured right now. It still has hail damage from a major hail storm that happened in 2012. The undercarriage is starting to show some surface rust. And, like I said, it needs a new battery. All things that you'd expect from a truck that's ten years old and has 140,000 miles. The interior, surprisingly, still looks like it did the day we took it home. No tears in the seats or cracks in the dashboard. My dad replaced all the lights in the dash right before he got hurt with blue LEDs that match the color of the truck. I don't know if it's because this truck holds a special place in my heart as my childhood favorite, or if it's actually a good truck, but I think as a truck, this is the best as it could get in 2004. Yes, I know the interior is a mess of cheap plastic. And I know that 300 horsepower from a V8 is dismal by today's standards. But "Big Blue" is as good as a truck can get if you ask me. Growing up, I would say that my dad drove a monster truck and my friends would be amazed. Everyone loved riding in the truck because of the commanding view it had over other cars. I know now that it isn't as big as little me thought it was, but it's always fun remembering how I would ask my dad to take me to school in the monster truck. My dad wants to trade it in on a new Impala, and frankly, I hope he doesn't. Because I would genuinely miss the big thing.